I love, love, love Christmas, completely over the top love it so when I was recently asked to take part in a fun Santa’s Grotto design challenge by Mobile Mini I was really looking forward to getting creative and Christmassy. The challenge was to design a portable Santa’s Grotto that would fit into a storage container. I love how magical Christmas is for my nephew so I wanted to try and recreate that magic in the portable grotto challenge. The fun starts outside the grotto where there are two giant nutcracker statues guarding the entrance. As you step into the grotto the crisp (fake cough, cough) snow will crunch underneath your feet for that authentic Christmas feel. The ceiling is created to resemble the twinkling night sky and every now and again you might just see a reindeer practising their flying (animation can do that right?). The walls were the idea of my interior design assistant (aka my nephew Maxx! ), he said that sometimes it takes a long time to see Santa and it would be good to have something to do whilst waiting so the walls are a huge colouring in page to keep little and old kids entertained. If you look closely you might notice some foot prints on the fresh snow – elf foot prints of course! Follow the footprints past the gorgeous Christmas tree that’s brimming with baubles, lights and of course presents. 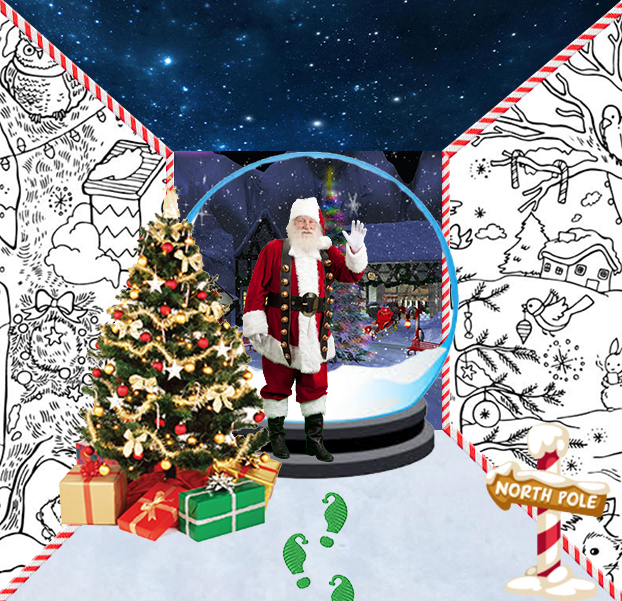 After the tree is the main attraction, a large snow globe where Santa is waiting to meet and greet, where it’s snowing and where it appears you’re in the north pole thanks to the North Pole backdrop and twinkling night sky. The grotto is finished off with candy cane skirting boards and coving to tie the whole look together. How would you design Santa’s grotto?